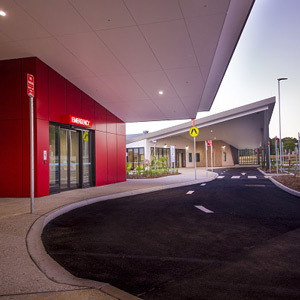 Construction contractor Brookfield Multiplex has delivered Byron Central Hospital, in Ewingdale, New South Wales, one month ahead of schedule. The hospital site, designed by architect Nettleton Tribe, comprises three buildings on 9,400 square metres. Servicing Byron Shire, the $88 million hospital features an emergency department, a large maternity unit, standard wards plus a number of integrated community based services including nursing, allied health, mental health and drug and alcohol services. The site proved a challenge as its location in a rural farm area meant critical infrastructure, including arterial roadworks, needed to be constructed on a brownfield site with 16,000 vehicle movements a day. “This is a fantastic project for the Byron Shire. We have enjoyed being part of the community for the past year and working with local businesses, schools and job service providers,” said David Ghannoum, Brookfield Multiplex Regional Managing Director of New South Wales. Construction also benefited the region through employment, with more than 60% of workers coming from the Northern Rivers and southeast Queensland region. Indigenous employment provider Novaskill also arranged full-time employment for 11 indigenous trainees. Brookfield Multiplex adds Byron Central Hospital to its growing reputation for delivering successful health projects including Chris O’Brien Lifehouse at the Royal Prince Alfred Hospital, the Clinical Services Building at the Royal North Shore Hospital and the recently completed South East Regional Hospital, all in New South Wales.